I don’t remember why I picked up The Case of the Man Who Died Laughing by Tarquin Hall. Perhaps it was the strange title (How exactly does one die laughing? Did he have a stroke in the middle of relaying a funny joke? Was he assassinated while watching a particularly hilarious Youtube video?) More likely, I was drawn in by its brilliant orange and red cover that just begs to be picked up. Either way, I’m glad I gave in and stumbled into the improbably delightful world of Vish Puri, India’s Most Private Detective. As it turns out, the man who died laughing is Dr. Jha, a firm rationalist, Guru Buster, and notorious opponent of India’s spiritualists, magicians, and occultists. Yet he’s murdered by the goddess Kali, consort of Shiva, who hovers in the air as she runs a sword through him while he stands laughing, helplessly rooted to the spot. Even stranger, he’s murdered in the presence of a group of experts; professors, scientists, lawyers, all members of a weekly Laughing Club hosted by the famed Professor Pandey, a firm believer in ‘laughter therapy,’ and all of whom are also rooted to the spot, giggling helplessly as Dr. Jha is stabbed. Who then but Vish Puri, famed detective with an eye for uncovering irrational crimes and a fondness for all deep fried and spicy foods, can undercover what is at the very least, a very very strange mystery. And as Vish investigates this case, his gentle wife Rumi and determined mother, fondly referred to as Mummy-ji, also find themselves entangled in an equally puzzling mystery when a thief makes off with all the money in their women’s collective kitty. 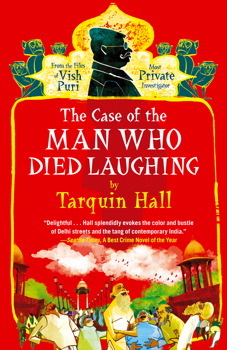 What I enjoyed about The Case of the Man Who Died Laughing (and other subsequent Vish Puri mysteries) is how brilliantly Hall evokes a sense of India. From the mystical to the modern, ordered hierarchies and disordered highways, famed scientists and infamous magicians, Puri’s India is vibrant and resplendent with colorful characters and delicious treats that are no match for Puri’s intuitive detecting and his ever-expanding waistline. Like the best cozies (mysteries with little blood, gentle adventures and lots of food) it is smart and funny, and you can’t help getting wrapped up in Puri’s chaotic yet loveable world as he tries to find out how on Earth a respected Doctor can be murdered in front of other experts by a shimmering goddess as they laugh and look on helplessly. Intricate in its mechanisms yet utterly engaging and delightful, this is one for the shelves.